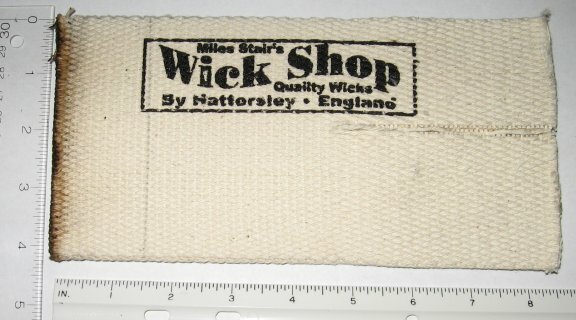 World's Largest Seller of Perfection Wicks!!! 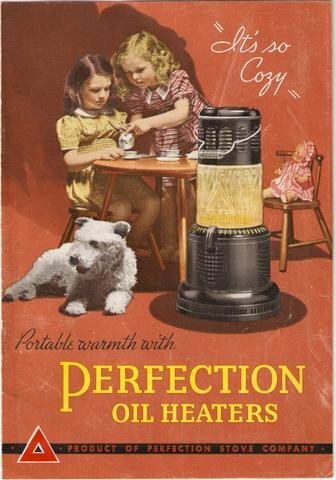 Perfection heaters used a removable font which sat in the bottom of the hinged tip-over body assembly. The modern font on the right is galvanized steel, whereas pre-war fonts were made of brass. 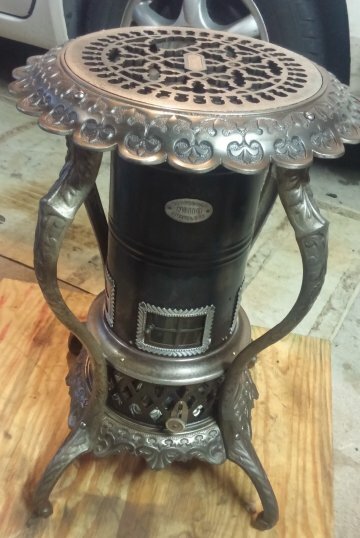 Both parts should be polished with a quality auto polish to prevent rusting or oxidation. When that portion of the wick that projects above the metal wick carrier has been burned away in use and the wick refuses to turn up any further, remove it and insert a new wick. 1. Remove Flame Spreader. Clean any soot from the flame spreader, paying particular attention to keeping the air holes clear of any debris. Even the top of the flame spreader (far right) should be cleaned & polished for best results. 2. Remove the Gallery by turning counter clockwise. That is often easier said than done, as the threads on the bottom of the gallery can become corroded to the font. The sides of the gallery are fragile, being filigreed with air holes; if the gallery does not remove easily, a strap wrench on the bottom offers a better chance of removal without damage. After removal, apply silicone or high temperature grease to threads after cleaning them off. If the gallery is stuck: Go slowly! Read below for some clues. 4. Pull out both the used wick and metal carrier from the wick tube and throw them away. Click on the photo on the right to enlarge it, and the cog wheels which raise and lower the wick are quite visible. Old Perfection heaters are being refurbished and put back into service. 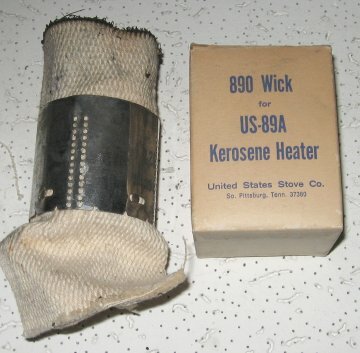 Sometimes these heaters have not been used for decades, and the wick raising mechanism does not readily move the wick. DO NOT FORCE THE WICK TO MOVE USING THE WICK ADJUSTER! The usual problem with a stuck wick is the wick being glued (old fuel residue) or rusted to (ambient moisture) the center air pillar. You do NOT want to try moving the wick with the wick adjuster, as that will just strip the gears and star wheels. Use a slender blade knife, like a fillet knife, and slip it between the wick and the central air pillar. Work the blade all the way around the central air pillar to loosen anything holding the wick to the tube. Then grab the WICK CARRIER with your fingers or even pliers - on opposite sides of the wick carrier - and pull the wick straight up and out. 5. Remove new wick from carton and straighten out folded-in ends of wick. 7. Turn wick down as far as it will go by means of adjusting wheel. Large Mica window (4'' x 5") for Perfection heaters that have windows. These are NOT the glass chimneys for art deco design Perfection heaters. Easily cut with scissors to fit individual heaters. No notches; heavyweight mica. $7.95 each. 8. Replace gallery by turning clockwise as far as possible. Be sure that the threads on bottom of the gallery squarely engage threads on reservoir. 9. Turn the wick up level with the top of the wick tube. (If uneven, level it by pulling up the low side of the wick.) Clip any loose threads or raveling projecting from the top of wick with scissors. 10. Replace flame spreader. Fill reservoir with kerosene and allow the wick to soak for a half hour before lighting. 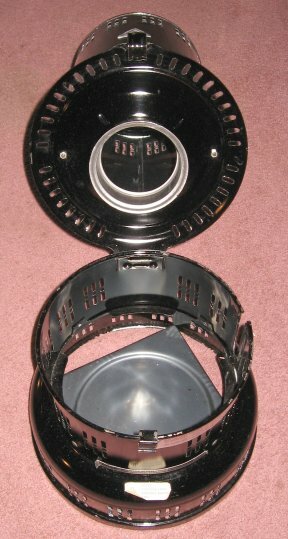 Tilt upper drum back and remove reservoir. Lift up filler cap and fill the reservoir with a good grade of kerosene. If the reservoir is full the rod in the center of the filler cap will be raised about two inches above the filler cap. This rod, which is part of the built-in fuel gage will return to its original position as the kerosene is used up. Replace reservoir in heater. 1. With wick turned down, first make sure that flame spreader is secure in its position on top of wick tube and that gallery is screwed down tight. 2. After giving wick time to become saturated with kerosene, using hand wheel, turn wick up until flame spreader stops it. 3. Apply lighted match to SIDE of wick in several places. 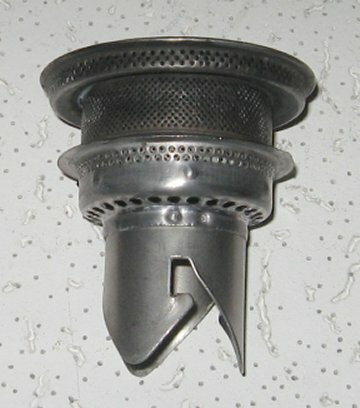 Adjust flame height after the flame spreader attains maximum heat. 4. Close heater and make sure that catch is securely fastened. The safety catch should be locked under the lowest lug. If heater has a spring catch, make sure that it snaps into the closed position. Turn wick down as far as it will go. This will permit flame spreader to drop on top of wick tubes and extinguish flame. 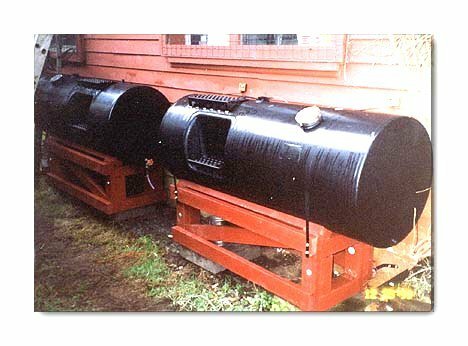 When heater is not to be used for a month or longer, empty reservoir and store heater in a dry place. If there is danger of rust, steel drums should be protected with oil, or better yet, by cleaning, then polishing with a good grade of liquid auto polish. 1. Keep the perforations in the gallery open. Keep the perforations in the gallery free from lint and dirt by wiping gallery every day or two. 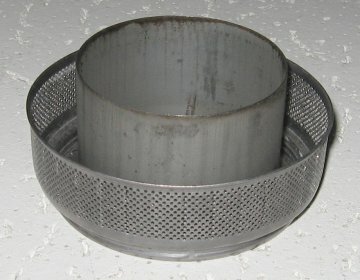 If any of the perforations become clogged, the air supply is reduced, causing the heater to smoke. 2. Keep the flame spreader clean. With a stiff brush, clean all perforations and with a knife scrape the carbon off the flange against which the wick strikes. Hold the flame spreader to the light to see that all perforations are clean and open. 3. Keep wick tubes clean. 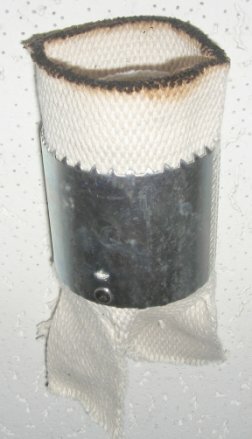 Keep the char cleaned from the top of the wick tube by wiping with a cloth. 4. Clean wick daily. If the heater is in daily use, clean the wick daily. Remove the flame spreader and raise the wick until the top portion is even with the top of the tube. Wipe loose carbon or char off the top of the wick with a cloth. Pat the remaining wick down evenly with the fingers. Do not allow reservoir to burn dry. Each time this happens, one-quarter inch of the wick is consumed. 6. Supply plenty of fresh air. 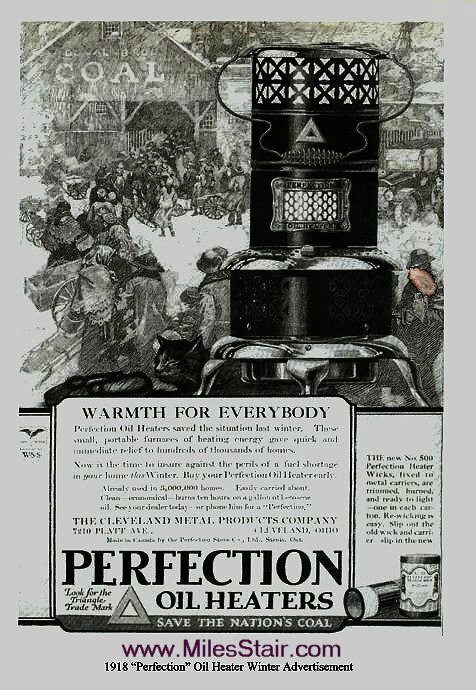 Perfection heaters burn many hundreds of gallons of air to each gallon of kerosene. When used in a bathroom or other small space, leave the door ajar two inches so that fresh air can flow in. It will be warmed as it passes up through the heater. Insufficient supply of fresh air will cause the heater to smoke. 7. Use pure kerosene. Use only a good grade of kerosene. Never mix gasoline, even a small amount, with it. It is desirable to drain the reservoir occasionally and then put in fresh kerosene. This will safeguard the reservoir and wick carrier from possible corrosion and rust. CAUTION: If used on a trailer, boat or other moving conveyance - NEVER operate this heater while in motion. A serious fire may result. 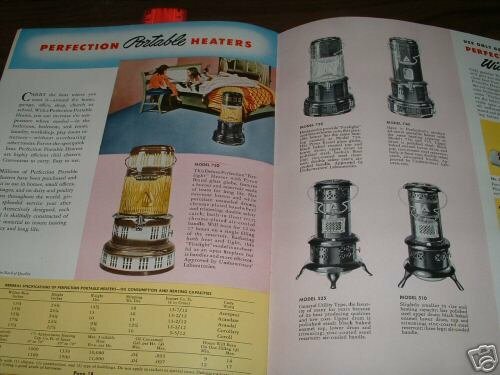 Perfection heaters do not have a safety tip-over switch, being designed in the days when people used common sense, not their own personal lawyer. 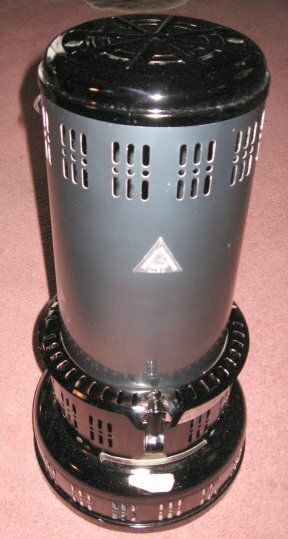 Parts of this heater have been oiled to prevent rusting. Before lighting heater for the FIRST TIME, wipe thoroughly with a cloth. Since the remaining oil will burn off, causing a disagreeable odor for ten or fifteen minutes, the heater should be placed where this odor will not be offensive. Go slowly! The gallery is very thin. It cannot take much leverage. Penetrating oil, let is soak in, more penetrating oil, then freezing. Then try it. The gallery can be stuck from two reasons: old oil residue, and rust/corrosion. Penetrating oil can infiltrate the old oil residue, given time, and can break the rust/corrosion barrier, given time, but it will still be difficult to turn in the threads. Remember that metal expands and contracts with heat and cold, respectively. By placing the font/gallery assembly in a freezer at 0F, the metal will shrink and further weaken the bond binding the threads. If that doesn't free it up, then the application of heat might well do it. But brute force applied without giving any type of penetrating oil time to work will almost always result in a bent gallery. If the gallery and fount are not rusted, merely glued together from old solidified fuel residue, then boiling in detergent and hot water is the easiest way to get parts "unglued" so they can be removed without damage. 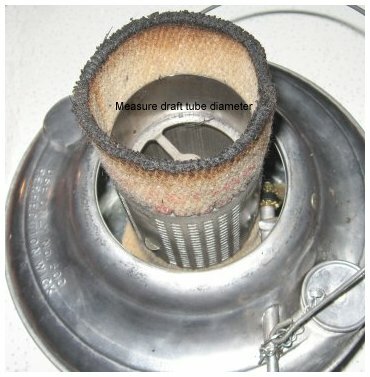 Use the same procedure as for center draft flame spreader lamps, as the Perfection heater is essentially an oversize center draft lamp. It takes a larger boiling pot, but this method does work. Reader Mark H. in MA wrote: "I found if you use "PB Buster" (an automotive parts rust buster penetrating oil) sprayed around the gallery and the fill gauge it helped break up and dissolve the old gummed kerosene. It works great." 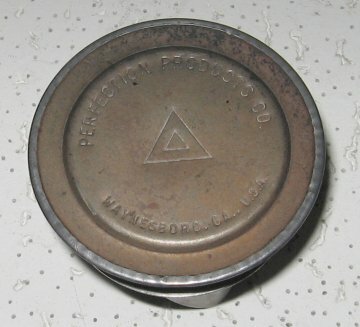 It is not uncommon to find pinholes in the fuel tank on old Perfection heaters, particularly post-War steel fonts. If the holes are not too large they can be repaired. I sand the area of the leak smooth, pick at the holes with a stout sewing needle to clean debris from the holes, removed any oil from the metal with acetone, and apply a thin layer of J-B Weld epoxy over all areas that even appeared to have indentations or pits. After drying/curing, I sand the J-B Weld smooth, put the tank on a piece of newspaper, and pour in some fuel. It works! No leaks. J-B Weld epoxy can be easily applied with an artist's paint trowel, so little sanding is required. Of course all the sanding required to get to bare metal (so the epoxy will stick) removes the galvanizing, so the tank must be painted with an anti-rust type spray paint to prevent future rusting. J-B Kwik Weld works as well as the slower curing J-B Weld for this purpose. The trick to success in sealing the leak is complete cleanliness before applying the J-B Weld. 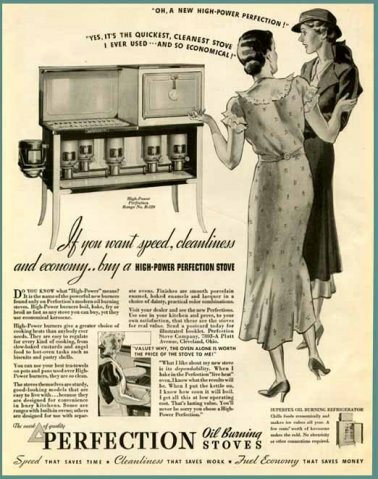 The tank must be emptied, wick assembly removed, sanded or whatever to clean the entire area where the leak is, then repeatedly brushed with acetone to remove residual kerosene. A thin layer of J-B Weld pressed into the seam or over the leak with an artist's trowel, then smoothing, will seal the seam. Let dry in that position for two (2) very long days (regular J-B Weld, 12 hours for Kwik Weld). Then put enough fuel into the tank so that the fuel level is above any repairs, set it on a section of newspaper, and watch for leaks. The newspaper will tell you if there are any leaks and where they are located. Then and only then can you again empty the tank, clean and sand, and paint with a zinc based paint like Rustoleum. Leaks or stress cracks in pre-War brass Perfection fuel tanks should be soldered. 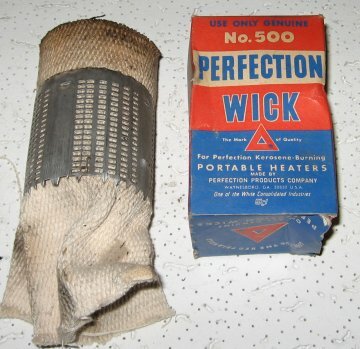 So many Perfection heater clones were sold that some manufacturers had their own brand name on Perfection 500 heater wicks. 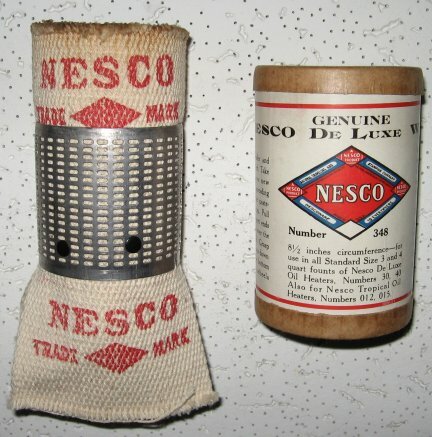 Above left is an original NOS NESCO wick. The cute little round box is marked "Number 348. 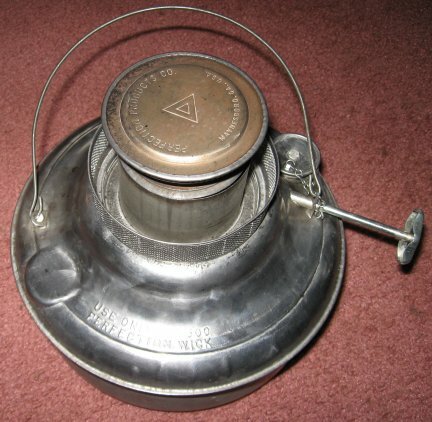 8 1/2" circumference - for use in all Standard Size 3 and 4 quart founts of Nesco De Luxe Oil Heaters, Numbers 30, 40. Also for Nesco Tropical Oil Heaters, Numbers 012, 015. To trim, rub with cloth or paper." 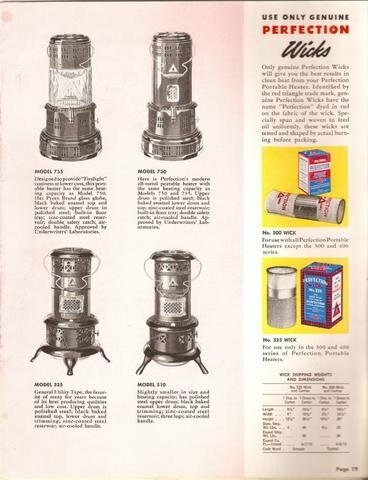 Above right, a US Stove Co "500" wick. Click photos to enlarge. For photos of Perfection heaters, see the Photo Album. If your font has leaks, it can often be repaired.